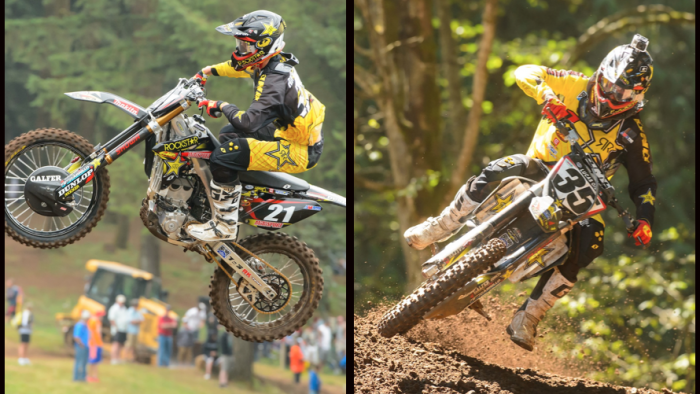 Rockstar Energy Racing traveled to the only stop in the beautiful Pacific Northwest for round 8 of the Lucas Oil Pro Motocross Nationals. The Huffman's once again had the very scenic track looking spectacular for racing in front of another huge crowd of race thirsty fans. The team experienced mixed results with some flashes of brilliance once again. Ryan Sipes is still struggling with small tip overs. Once again he started out the first moto very well. His lines were good, his riding aggressive yet smooth and he looked to be moving towards the top 5 rapidly. He put an incredible pass on Chad Reed, clearly setting up for it several corners ahead. He was being patient and smart. Then as he was taking different lines in an attempt to pass another rider, he made a mistake as he attempted to hop over a hole in the track and lost his front end. After he remounted, he just didn't seem like the same rider. He was able to move back near the top ten, but was clearly frustrated. His second moto did not start well as he came into contact with a group of riders sending him to the ground again, in a pile up. Although Ryan has had some consecutive races that have not gone well, he needs to remain positive and work on the small things that are holding him back because he is very close. Ryan Sipes: "Washougal was frustrating for me. My speed was there but I just couldn't stay off the ground. I ran in the top 5 both motos before my crashes. It's just tough to pick yourself up from that and not be bummed. I'll keep working on stuff and try to come back strong at Millville. It'll come around." Jason Anderson's first moto start did not go as planned. He had a good jump but was pinched off going down the start straight and forced way back in the pack. He began moving forward trying to pick off rider after rider. He then made a mistake of his own, hitting neutral in a soft sand section. When having no power to the rear tire in that sort of situation, a crash is nearly inevitable. After Jason got back on his bike and reconvened, making up any ground was tough. All the other riders in front of him were top guys and had fell into a freight train pace. Everyone was going the same speed and that is how moto 1 continued til the end. Moto 2 was a different story for Anderson. He didn't get a stellar start but he moved forward quickly all the way up to 5th. At times he was the fastest rider on the track. He ran a pace consistent with Eli Tomac for much of the moto. That is a big statement considering the way Tomac ran away with both motos. Jason is very near a major breakthrough. Jason Anderson: "We're here at Washougal and the sun is shining. Alright day. I was riding good. Rode good most the day. Had a good last moto and ended up going 11th and 5th so I was happy." Rockstar Energy Racing will now travel all the way back east to Minnesota for the Spring Creek Motocross National in Millville. Both Sipes and Anderson will look to improve on their up and down finishes and put two solid motos together.